Over the past few weeks, we've sought to understand the science behind the unfolding disaster in Japan. But a fascinating statistic from Wikipedia shows that hits on "Godzilla" jumped tremendously after the disaster too. What does this say about us? As we struggle to assimilate news about the quake, tsunami, and nuclear power plant leaks in Japan, many of us turn to rationality for comfort. We've tried to educate ourselves about how radiation works, and whether earthquakes can be predicted in future. Ultimately what we're trying to find, though, is perspective. It seems like the worst disaster we can imagine, but is it really? Knowing the answer to that question can help us view what's happening without being overwhelmed by fear and sadness. I would argue that people are looking up Godzilla on Wikipedia for the same reason. It's become a kind of pop culture joke that Godzilla is a symbol of atomic disaster in Japan. But there's a serious side to the joke, a poignant side. The big rubbery monster is the antagonist (and later, protagonist) in our best-known modern fable of nuclear destruction. When people search for Godzilla in the wake of atomic destruction in Japan, they are looking for context and meaning - they are following the same impulse that drives other people to learn about millisieverts. If you've never watched the original, 1954 Japanese film Gojira (not the Americanized Godzilla with Raymond Burr), I recommend that you do it. It's available in a remastered edition with English subtitles. The movie is a frightening, dark story that conjures up the firebombing of Tokyo and the atomic hits at Hiroshima and Nagasaki in horrific detail. It is a film that tries to contain all the chaos and terror of natural and human disasters in one place, the body of a giant monster. A monster who can be seen (unlike like radiation) and contained (unlike human evil). 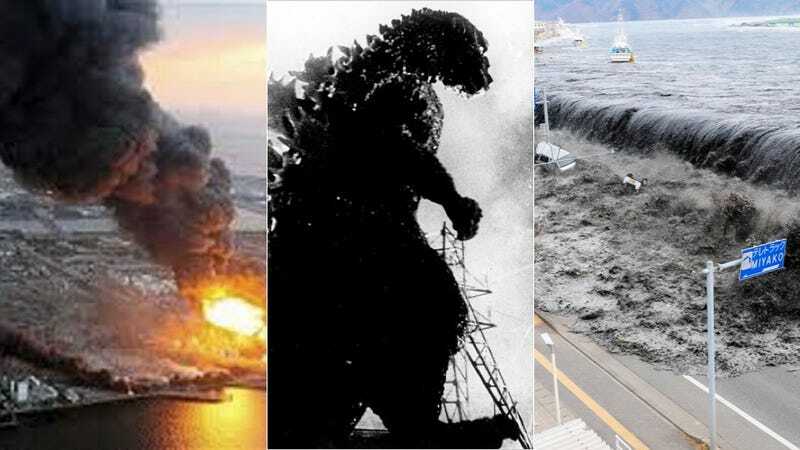 A monster who is ultimately defeated by science and rationality and a few brave, selfless people willing to give their lives to keep Japan safe. Though scientific explanations of natural disaster give us rational perspective, fables like Gojira give us emotional perspective. As silly as it sounds sometimes, as humans we need both.